This week’s Highlands real estate spotlight is on 726 Blue Valley Road, a nice home in a peaceful location. 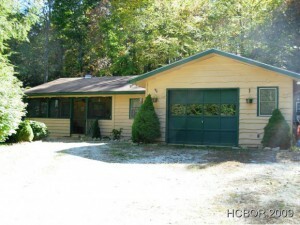 Blue Valley Road is a quiet road and this three bedroom, two bath home is situated on a lot that is 1.65 acres in size, with a beautiful yard and mountain view. Single level living makes this lovely home that much more appealing. 726 Blue Valley Road in Highlands NC has a living area that opens to nice dining room off of the kitchen. The master suite is separate from the other two bedrooms and has its own private deck. There is a separate outbuilding that could serve as a studio or a workshop. This is a perfect mountain getaway at a great price. Contact me, Lynn Kimball, today to schedule a private showing of this home or any other Highlands property currently listed for sale. I welcome the opportunity to serve as your guide to real estate in Highlands and help you locate a home that suits your needs and your lifestyle.